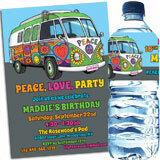 What makes a groovin' hippie birthday party? Food, fun, friends and the right 60's party supplies are the key ingredients. The good news is, you don’t have to spend a huge amount of money to have a great event. Just do what’s right for your guests and your budget. 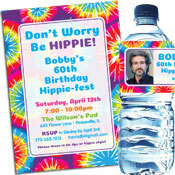 Let Party411 help you plan a party perfect for the hippie in you! Check out our tips and tricks below. Birthdays beg for a truly unique invitation! We can design a decades caricature invitation of the guest of honor. Have the birthday boy or girl groovin' on a disco dance floor or hanging out of the window on a tie-dye bus; the sky's the limit! Not only is this invite genuinely special, the art for this invitation can be used for a sign in board, welcome cutout, photo opportunity or even thank you notes. 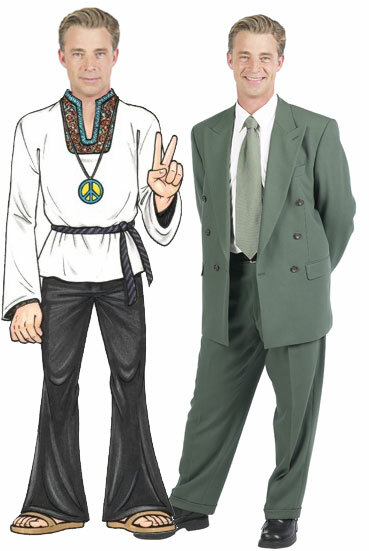 Throw a peace sign necklace in the envelope so your guests have something to get their 60s theme costume started. If you'd like to have your guests dress up, make sure to tell them this at the bottom of the invite. Put a little confetti to each envelope for an easy way to add something special to your invites. You can always choose to make your own invite, too! Cut a peace sign or peace fingers from tie dye craft paper and then write your party info on it with a white paint marker. Wrap some 60s party beads around the invite to finish off the look! Whatever you decide, make sure to send your invites out 6-8 weeks in advance, so family and friends have time to mark their calendars and RSVP. Now you know they say "all you need is love", but a few decorations will go a long way too! Everyone will love the personalized hippie theme banner hanging outside the party area! It is weather proof so you can hang it outdoors to let everyone know where the party is at, or place it over the buffet as a room decoration. As everyone comes into the party room, greet them with a lifesize cutout of the guest of honor dressed as a hippie! Here are some good examples: Hippie Female, Hippie Teen Girl or Hippie Male. Daisy Bead Curtain- Easy addition to the doorways at your party, or hang several behind the buffet as a wall decoration. Groovy Balloons - Perfect party decoration! Place balloon bouquets at all of your important party locations. You can use 60s theme cutouts like peace signs and big flowers to decorate the walls. For a larger event, hire a lighting company to project these images on the walls in a variety of colors. Tie dye paper goods are just perfect for this theme, or if this is a milestone birthday think about using milestone birthday paper goods. Put a tie dye cover on each of your tables to give your space a pop of color! Flowers are always a great option, and many florists sell rainbow dyed daisy bouquets. Purchase a few bunches, and pop them in clear vases for easy-as-pie centerpieces. Tissue pom-poms would look great piled on each table and the buffet. A peace piñata also makes a great theme centerpiece. Just attach some tie dye balloons! Customize your centerpiece by choosing a photo for a tabletop lantern. If the birthday boy or girl is old enough, pick a photo from their real hippie days. Fits the theme perfectly while also adding a personalized touch to your table decorations! Have a bit of fun with your menu and serve a few foods that were new in the 1960s along with your regular party food; Pop-Tarts, Bugles, Shake 'n Bake, SpaghettiOs, Gatorade, Doritos, Easy Cheese, and Pringles all made a debut in the 1960s. And why not make the coup de grace of your party a layered rainbow cake! This dessert will look fantastic on tie dye paper goods. Day or night, great entertainment is key to the success of any party. A 60s party is a great opportunity dance party! Hire either a dj, or if you have the budget, a live cover band. Your guests will love listening to The Beatles, Jimi Hendrix, Crosby Stills Nash and Young, Santana, Joe Cocker, the Rolling Stones, The Who and other great 60s bands. You can dance The Twist, The Pony, The Bird, The Mashed Potato, The Watusi, or The Monkey! Your guests will be standing in line to have their pictures taken in a Hippie Bus photo opportunity. Woodstock or bust! If you have an outdoor space, tie dying t-shirts would be a hit. Just ask guests to bring an article of white clothing to dye. When the kids at your party aren't busy burning up the dance floor, have them stop by a friendship bracelet craft table. Make sure to have some adult volunteers on hand to help them get started! Of course, a balloon drop over the dance floor is a great way to end the night right! As your guests head out the door, make sure they have a great favor to take home! Pass out a sweet treat so guests remember your party. A scrumptious milk or dark chocolate candy bar with one of these personalized 60's theme birthday wrapper is a delicious souvenir: Psychedelic, Groovy, or Tie Dye. Add your own personalized message! 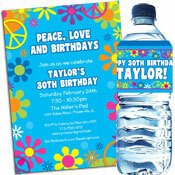 Your 60's birthday party will be so much fun; your guests will anxiously await your next event! With ideas and products from Party411.com you know that all your celebrations will be memorable ones.